Run Time 2 hrs, 10 min. People on trial, especially women that end up being executed make good theatre and film, as well as subjects of art. The two reigning queens whose lives still continue to resonate long after their deaths are Marie Antoinette (1755-1793), the last Queen of France, who literally lost her head, and Jeanne d’Arc (1412-1431) who went up in flames nearly seven centuries ago. Done in by politics, both were captured, jailed, put on trial, dragged through the streets and summarily executed, as a kind of entertainment before a boisterous crowd of unruly citizens. And ever since their demise each continue to be resuscitated for our viewing, listening, and reading pleasure. 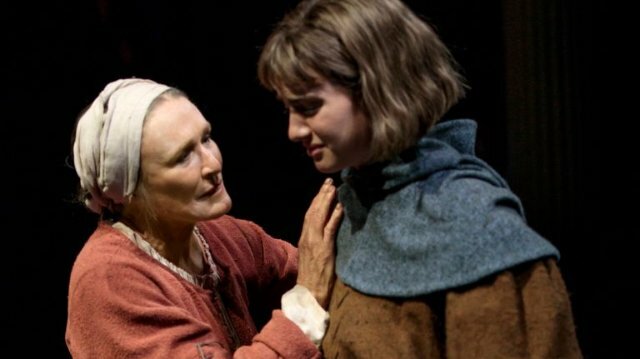 The latest Joan of Arc re-creation, currently playing at the Public Theatre in New York City through December 23, is Jane Anderson’s Mother of Maid, starring Glenn Close as Joan of Arc’s mother. There are three major reasons which make this play well-worth seeing. Glenn Close! Glenn Close! And Glenn Close! Her rock-solid presence, strongly insistent, as is her style, dwarfs every cast member around her. Obviously she is the play’s calling card. This is Mother of the Maid’s second go around, as the play had its world premiere at Shakespeare & Company in Lenox, Massachusetts in 2015. Since then Anderson restructured the play by eliminating one character, and combining two others, thus allegedly simplifying the play for future audiences. In the old version Joan’s mother shares the narration with Saint Catherine, the very saint who told Joan to drive the English out of France and bring the Dauphin to Reims for his coronation. In the newly renovated play, it is Joan’s mother alone – an interesting conceit – who gets to tell her daughter’s story from a mother’s point of view. The well-worn, well-known story of Joan of Arc, architecturally speaking, is usually presented as a straight-on retelling in which we get to follow Joan’s battlefront triumphs, capture, jailing, trial. Then on to when she is burned at the stake. All through these tellings it is Joan herself who appears in our face. Not so in Anderson’s version. Here, her Joan of Arc (Grace Van Patten), though half of the play’s title and main topic of everybody’s attention, from her mother Isabelle (Glenn Close), father Jacques (Dermot Crowley), brother Pierre (Andrew Hovelson) who follows Joan into battle, and minor characters in the play, come across, in all but her one prison scene, as background fodder. While Mother of the Maid skims the highlights of Joan’s short life, rather perfunctorily – she goes up in smoke at age 19 – the story as it unfolds here is shockingly shallow in depth. The overly simple seven-scene play presents all of the characters in an annoying folksy contemporary vein. Can you believe that the 15th Century Joan keeps calling her mother Ma? At best this is a Cliff Notes version of her story. Anderson’s Joan is presented as a somewhat petulant, oft morose teenager given to visions. The Maid is obsessed with leading an army to rid France of the English. Her peasant mother and father are depicted as hard working country bumpkins resembling, as some critics have noted, Hollywood’s Ma and Pa Kettle. Unfortunately, we only hear about the trial and superficially at that. Most of the action, including Joan’s private meetings with the Dauphine, take place off stage. No person of the middle ages, male or female, has been the subject of more study than Joan of Arc. There is a wealth of historical material available. The main sources of information are the chronicles. Five original manuscripts of her trial surfaced during the 19th century. Historians also located the complete records of her rehabilitation trial, which contained sworn testimony from 115 witnesses, and the original French notes for the Latin condemnation trial transcript. A wealth of similarly kept historical documents exists for Antoinette as well. Although all of the secondary actors in Mother of the Maid, from Joan’s father Jacques (Dermot Crowley), her brother Pierre (Andrew Hovelson), and Daniel Pearce who plays three roles, that of Father Gilbert, Chamberlain, and a scribe, turn in performances, as accomplished as the script allows. It is Kate Jennings Grant’s Lady of the Court, the most naturally spontaneous written character in the play that I found most interesting. Though Grant’s role as a noblewoman is on the smaller side, and she appears in only two scenes, her role, the least rigid in the play, is the only character that I wanted to see more of. Her skill in showing compassion, motherly love, friendship, and true self-reflection, was mesmerizing in its honesty. Equally alluring, in view of the extreme seriousness of Joan’s plight and her parent’s incessant worrying about the safety of their daughter, is Grant’s light touch which adds a few dollops of levity of which the play offers little. Least satisfying was the performance of Grace Van Patten. Try as she did, pitted against the play’s more seasoned actors, is tethered to a weak script. Patten’s Joan, in all but her prison scene when her mother comes to wash her sick, gaunt, and highly bruised daughter just before execution, strains believability. It is in this harrowing scene, as we watch Joan being roughly separated from her mother and dragged from her cell by a prison guard that pulls our heart from out of our chest. Though the play could have ended then, the last scene has each character informing us in monologues what happened to them after Joan’s death. The father’s tale, though he always suspected that harm would come to his daughter, was most heartbreaking. Sparing his wife the horror of watching Joan at the stake he sent Isabelle off to a chapel to the other end of the city so she would be spared the smell of the smoke. Wanting his daughter to know the he was proud of her he stayed to the bitter end, “till every last trace of his girl was gone.” He didn’t leave until the soldiers scooped up her charred remains and threw them into the river. It must have taken its toll as Jacques died in the ox cart on the way home. “His heart seized up. It was grief,” Isabelle informs us.